We have the wonderful old Egyptian and Crabbet bloodlines top and bottom. I lost my beloved Shammus and Mokha Magic in the summer of 2003. They both were with me for about 25 years. They were my best, always producing good solid foals. The young ones on my sales list are either last or second to last offspring of Shammus. He was a grand Sire and a gentleman. He passes his lovely mind and ability on to his offspring. They both will be greatly missed . Shahzada is now a lovely blk/bay two year old. She is mainly Egyptian bred, with a lovely blend of Crabbet. Shahzada comes from a long line of good doing horses. Her full sister SHAN'S EL MOKHTAR DELIGHT is a wonderful reining and cutting horse. If you are looking for a performance horse or broodmare take a look at her. Delight is a lovely chestnut filly, her Dam is Farris Sabrina, a pure Crabbet mare, her Sire is Shammus. 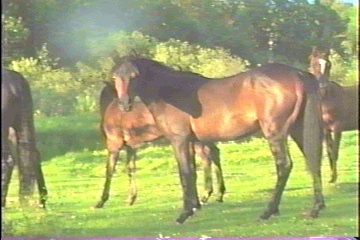 Delight is a beautiful two year old now, pictured here as a yearling. She is a moving machine, lots of action. She should mature to 15h.h. Updated pictures and pedigree to follow. Kesia is a lovely 4 year old now, pictured here as a yearling. Kesia has been saddled and ground driven. She is a joy to work with. Lots of action, Her Dam is Farris Sabrina. (Pure Crabbet) her sire is Shammus. She is a full sister to Farris Delight. Updated pictures and pedigree to follow. Transportation available. As we are concentrating on our BLACK purebreds and our BLACK Anglos, we are offering our beautiful 87.50% Egyptian Tobiano mare "LASA SPLASH" for sale. Through her veins flow some of the finest Egyptian blood, and she looks as exquisite as her pedigree. A HEAD & NECK hunters dream. 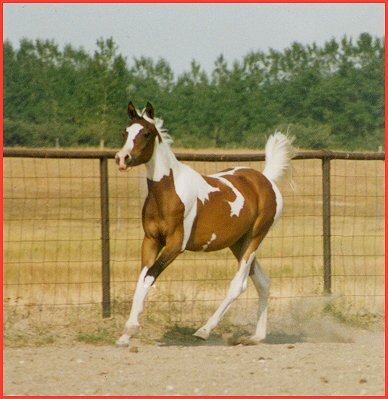 Splash had a beautiful tri color pinto filly by Shammus this spring. She is in foal to Shammus again, the foal will be 93.5% Arabian. 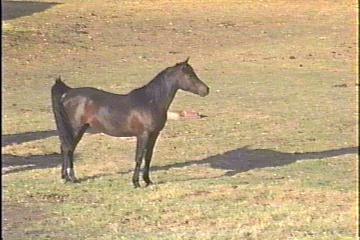 Splash foals with no problems and is a good mom. 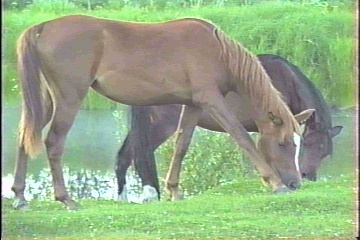 Splash would be an asset to any color breeding program. Check out Past Progeny to see the horses that have been sold.